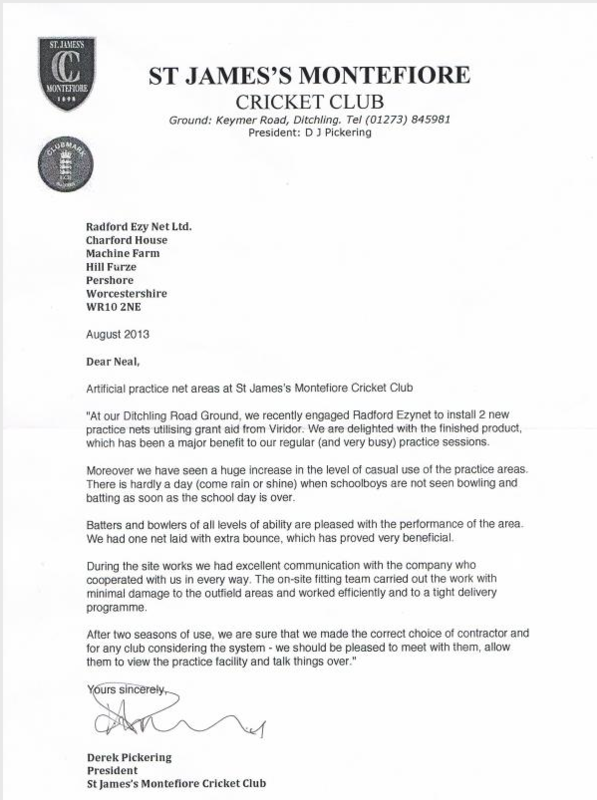 Thank you very much for carrying out and supplying Radford Ezy Net systems to both our grass wicket and artificial net area. 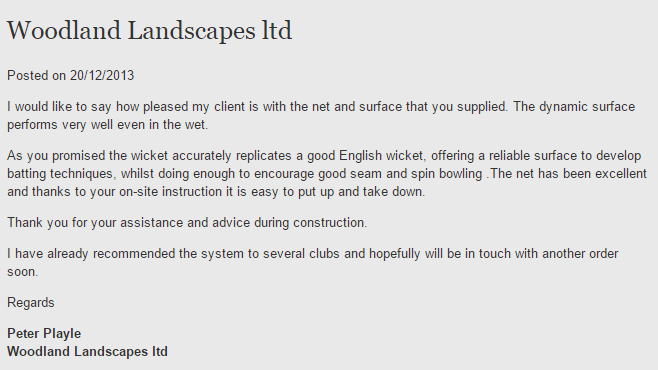 I would recommend these surfaces to anyone wanting to install artificial surfaces. 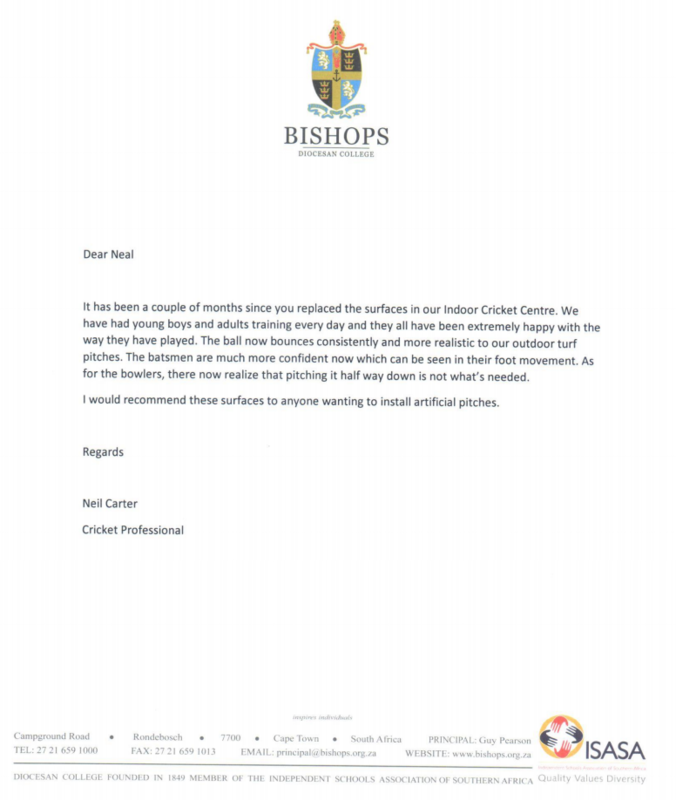 We are very pleased with our new facility and look forward to getting many years of high quality net practice out of it. 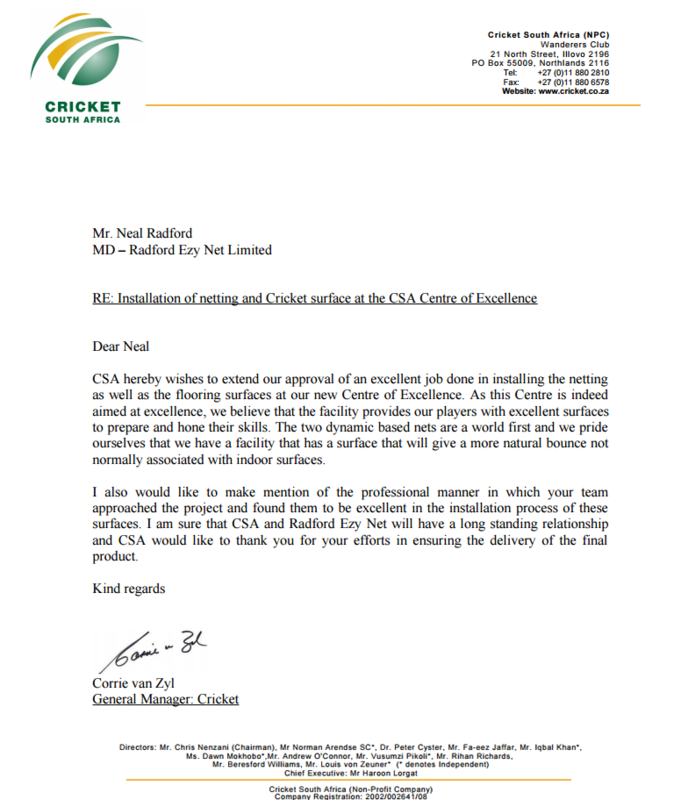 CSA hereby wishes to extend our approval of an excellent job done in installing the netting as well as the flooring surfaces at our new Centre of Excellence. 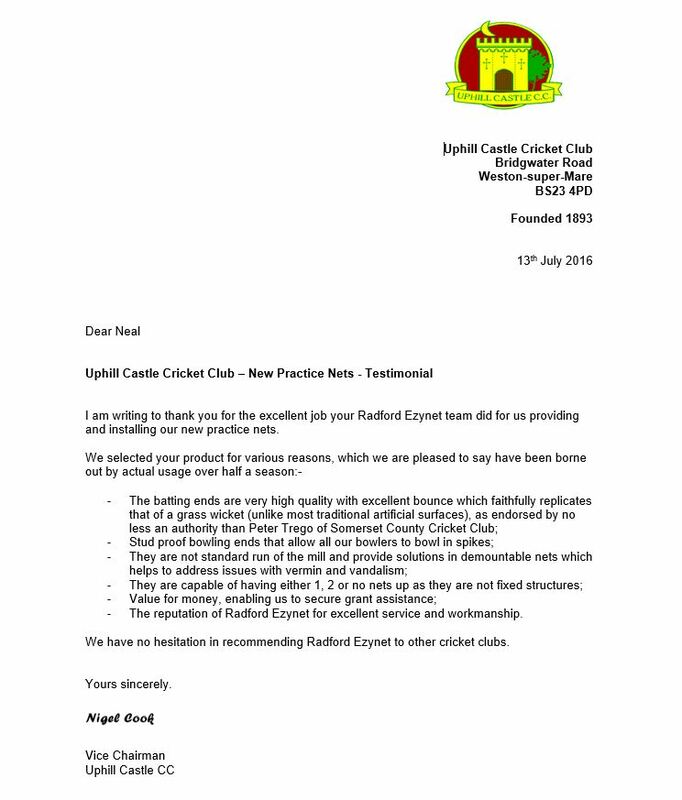 We must admit that their dedication to excellence and their attention to detail had been awesome. 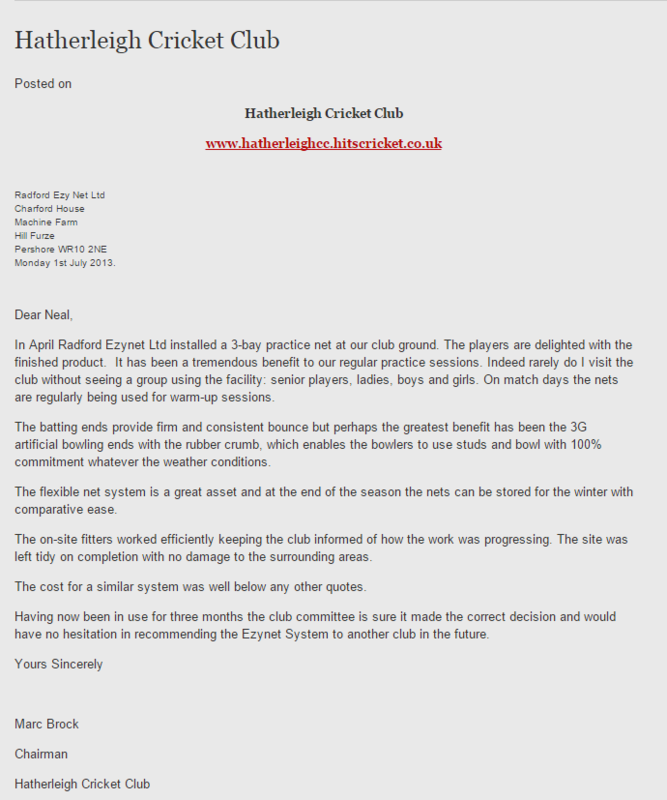 In April, Radford Ezynet Ltd installed a 3-bay practise net at our club ground. The players are delighted with the finished product. We are delighted with the finished product which has been a major benefit to our regular (and very busy) practice sessions. We're really pleased with the end result. 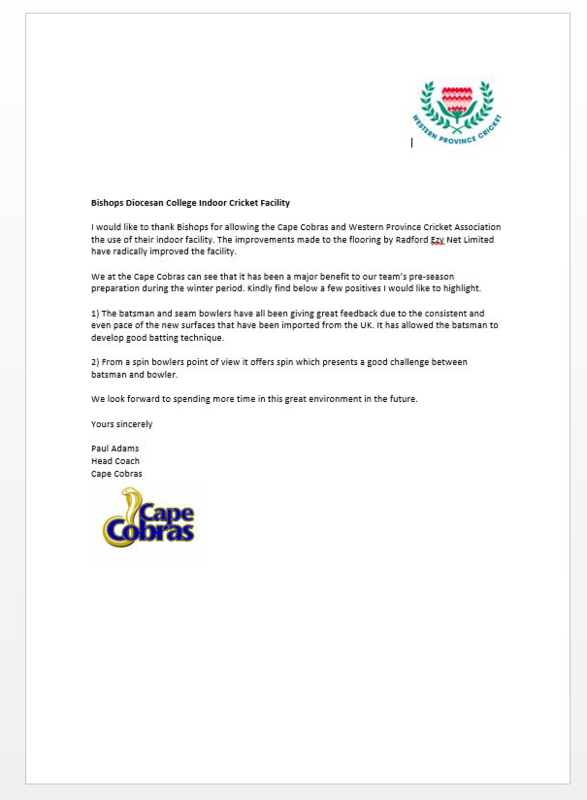 It has already made a big difference to our cricket programme here at Kingswood and I am sure that the students will continue to benefit from them for many years to come. 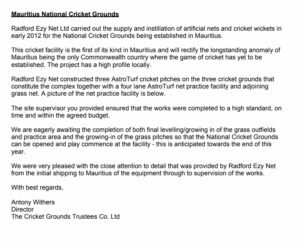 We were very pleased with the close attention to detail that was provided by Radford Ezy Net from the initial shipping to Mauritius of the equipment through to supervision of the works. 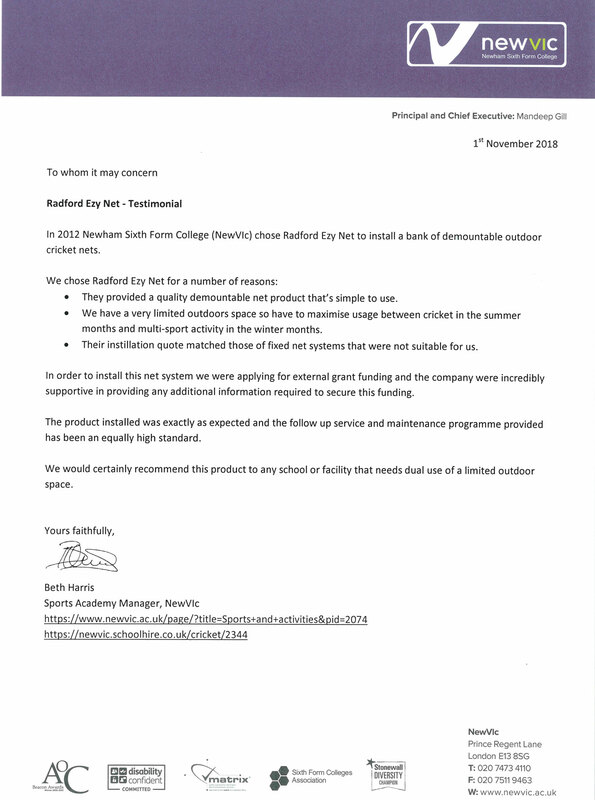 The product installed was exactly as expected and the follow up service and maintenance programme provided has been an equally high standard. 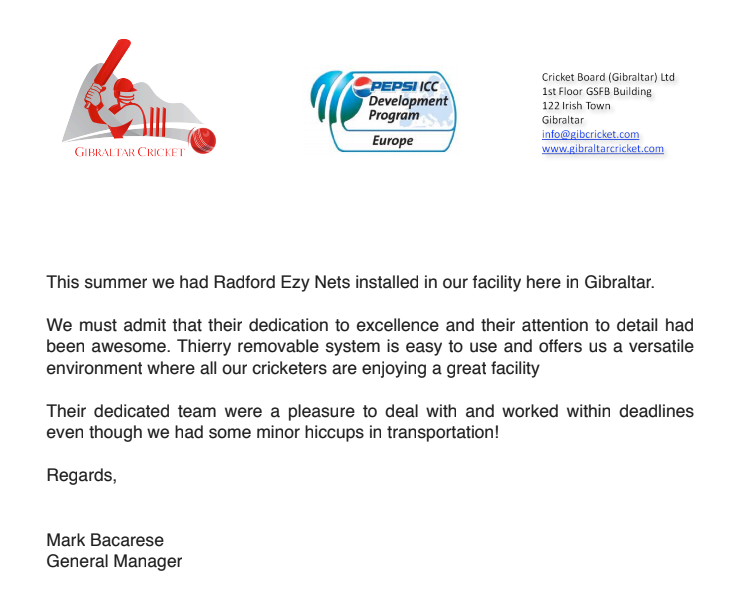 It is with great pleasure that I happily endorse and recommend Neal Radford and his terrific product EzyNet. We are delighted with the finished product, which has been a major benefit to our regular (and very busy) practise sessions. 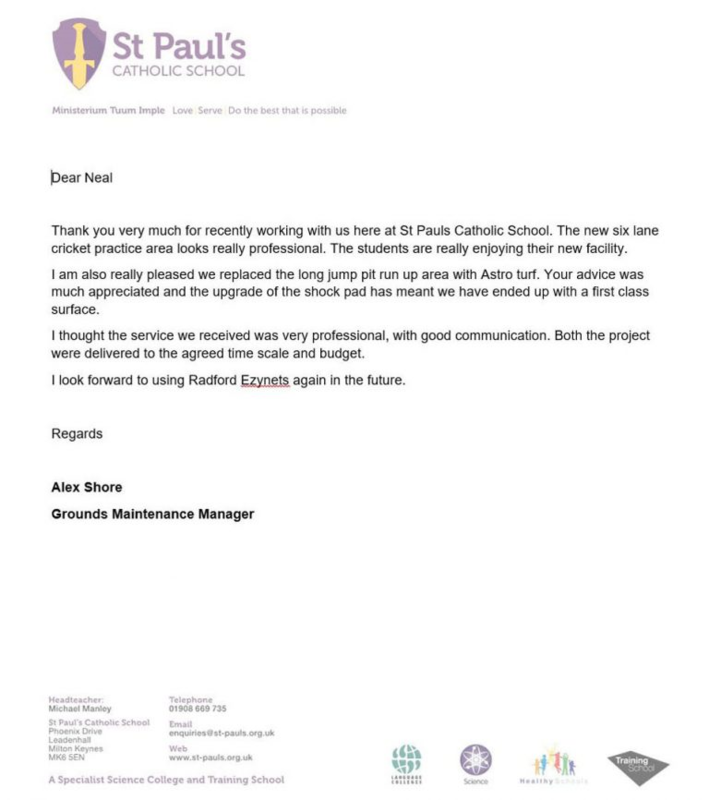 Thank you very much for recently working with us here at St Pauls Catholic School. 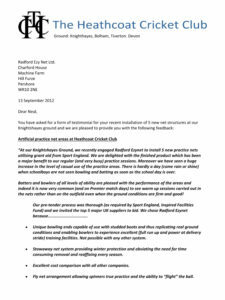 The new six lane cricket practise area looks really professional. The students are really enjoying their new facility. 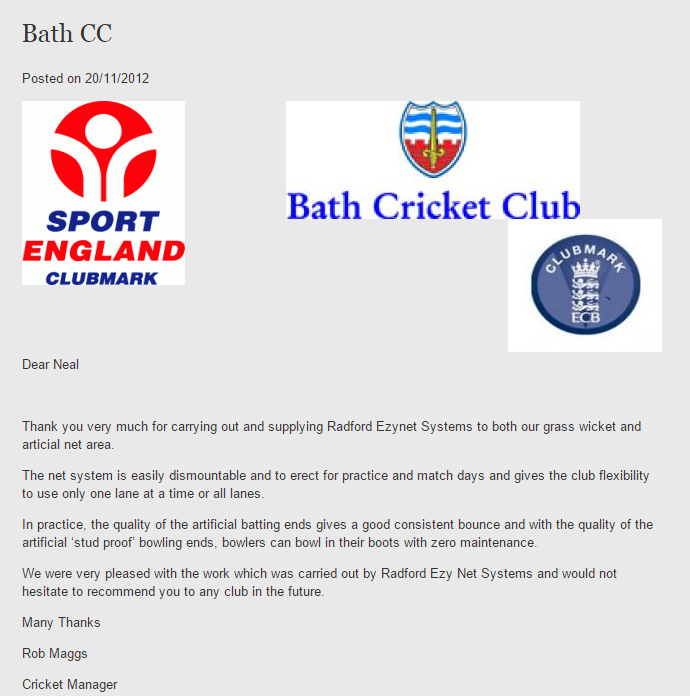 The Radford Ezy Nets system was chosen due to its unique dynamic stone base. 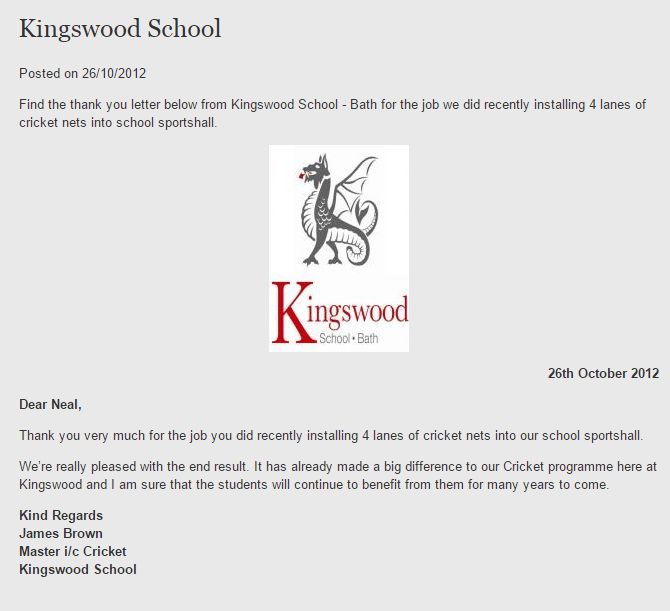 We are delighted with the nets installed. 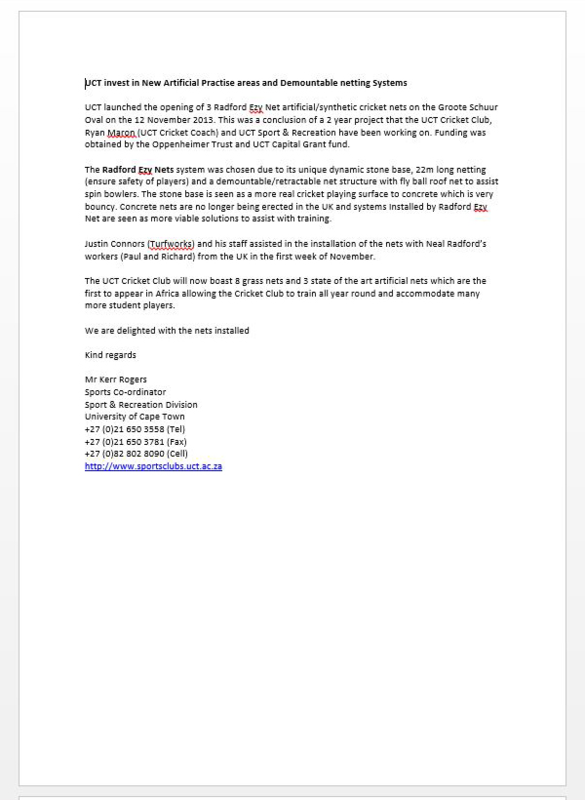 I am writing on behalf of the club to thank you and your team for the excellent practice facility we now have at our club. 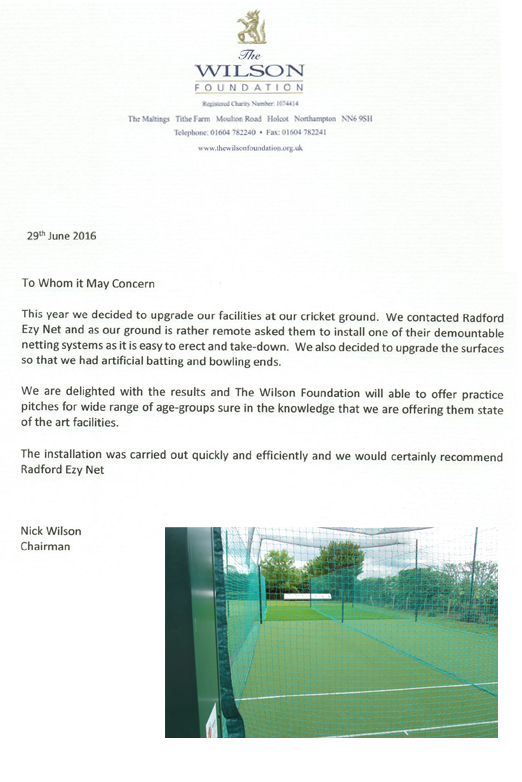 The improvements made to the flooring by Radford Ezy Net Limited have radically improved the facility. 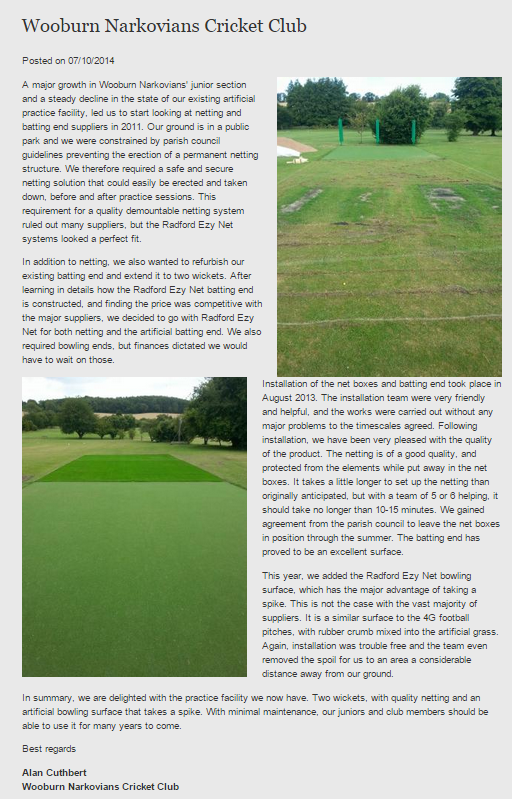 The installation was carried out quickly and efficiently and we would cetainly recommend Radford Ezy Net. 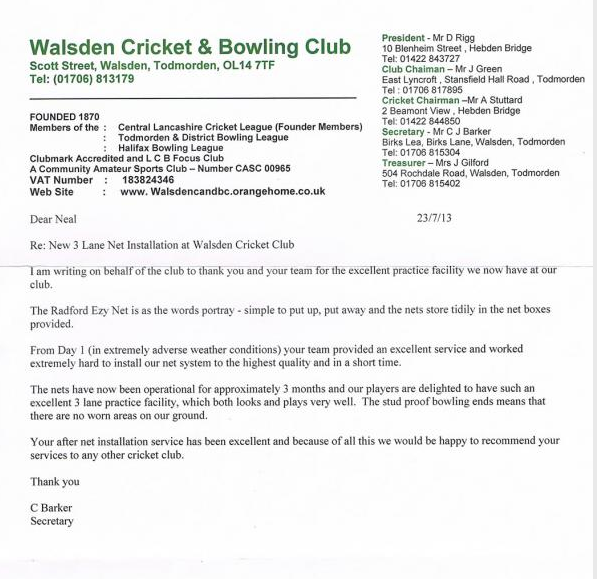 I would just like to write to you briefly to thank you on behalf of the club for taking the time to personally visit our new ground and to be so involved in the installation process completed earlier this month. 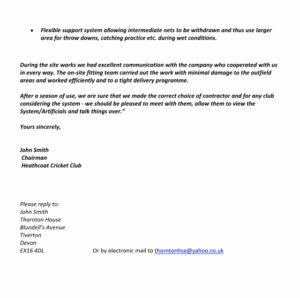 We are delighted with the practice facility we now have. 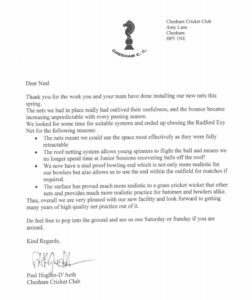 Two wickets with quality netting and an artificial bowling surface that takes a spike. 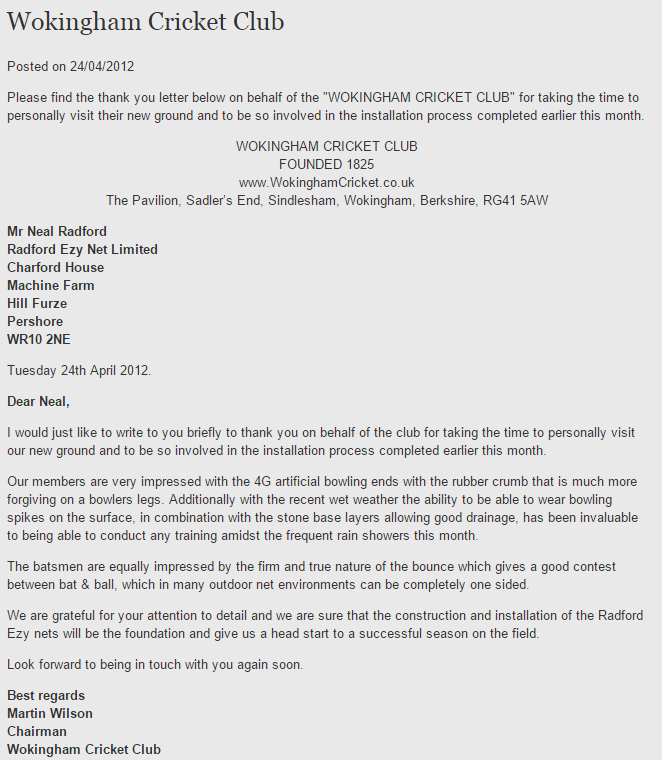 I would like to say how pleased my client is with the net and surface that you supplied. The dynamic surface performs very well even in the wet. 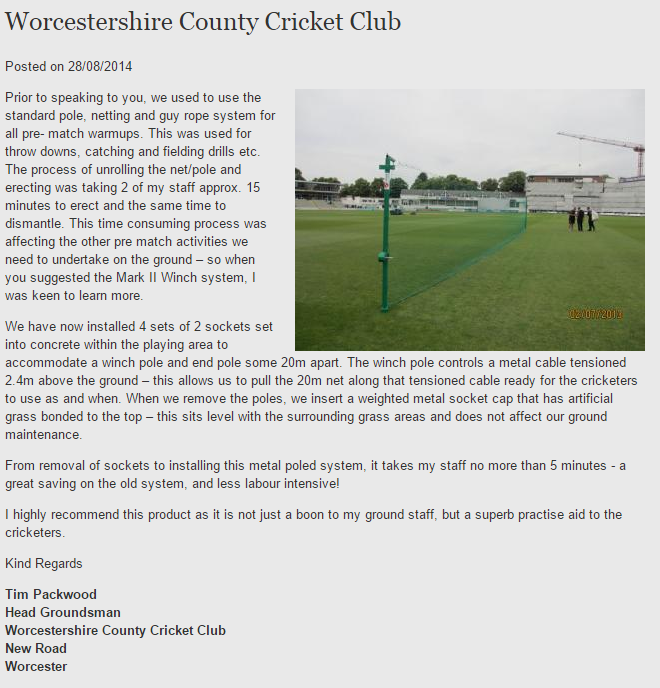 I highly recommend this product as it is not just a boon to my ground staff, but a superb practice aid to the cricketers. 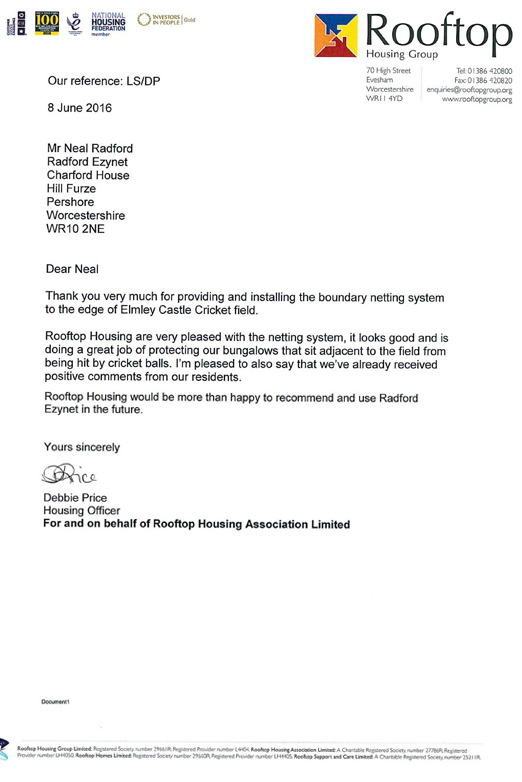 Rooftop Housing are very pleased with the netting system, it looks good and is doing a great job of protecting our bungalows that sit adjacent to the field from being hit by cricket balls. Still looking for some advice? 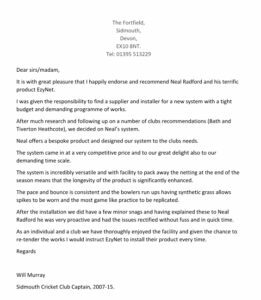 Get in touch with Radford Ezy Net today!